Vector Informatik provides developers with comprehensive support for the integration of Ethernet networks in vehicles as well as for the build-up of service-oriented software architectures. No matter if CAN or FlexRay are to be extended, partly replaced or if new use cases are to be developed: With the design tool PREEvision Ethernet networks or clusters can be described comprehensibly, clearly and from scratch. If Ethernet is to be integrated into existing network architectures, PREEvision guides the developer step by step through the complete design process: The dedicated user interface helps to design services and service interfaces, to implement the interfaces with software components and to define the IP-based communication including the configuration of VLANs and switches. 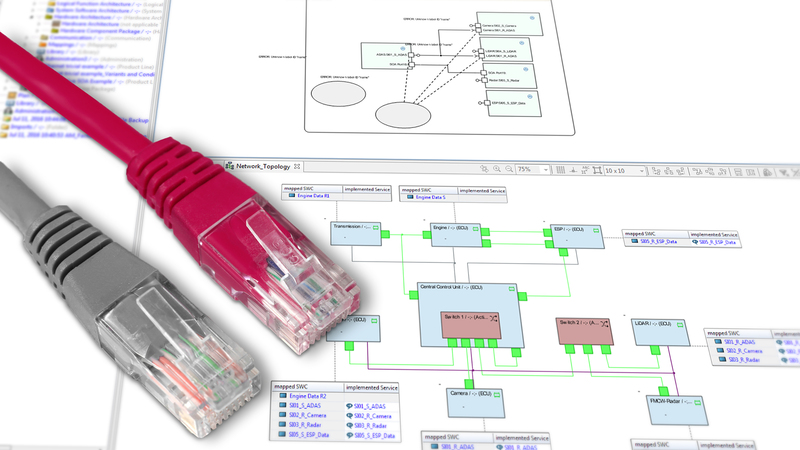 Besides dedicated tables for data input several diagrams in PREEvision ensures a good overview: Quality of service mechanisms of switches can be graphically modelled with the QoS switch diagram and the network diagram provides a highlighting for VLANs. Service-oriented architectures (SOA) can be developed with the UML-based SOA diagram. And packet diagrams visualize the relations and dependencies of services. Automations relieve the designer and speed up development: Based on a service design, PREEvision generates the corresponding software types and software interfaces and can automatically connect the services. A good deal of the communication artifacts is also automatically generated. Furthermore, PREEvision checks for completeness and secures a AUTOSAR-compliant description. PREEvision 8.5 supports AUTOSAR classic to version 4.2.2 – PREEvision 9.0 will bring an extension to AUTOSAR 4.3 and the AUTOSAR Adaptive Platform.